My Little Pony: Friendship is Magic creator Lauren Faust has stepped back from her pastel equines to work on other projects. One of those projects is Super Best Friends Forever, a shorts series for DC Nation, and this is her Supergirl. As we've mentioned before, Super Best Friends Forever stars Supergirl, Batgirl, and Wonder Woman, who team up to fight crime. 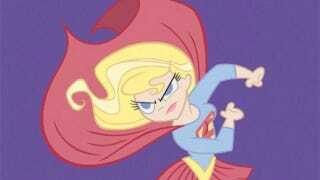 Faust, who also worked on The Powerpuff Girls and Foster's Home for Imaginary Friends, is a great choice to handle these superheroines, and this first Supergirl image suggests that she's bringing her My Little Pony flair to DC's lady heroes. Please let this turn into a 22-minute series. Please, please.